Wow, last week was a hell of game. One of the most exciting and insane games I’ve seen in a long, long time. So, for anyone that wasn’t sure how much of a difference a quarterback can make, see last week. A healthy Vernon Adams has been the spark the Ducks need to keep their Pac-12 North title hopes alive. Speaking of great quarterbacks, one of, if not the best, quarterback in the Pac-12 comes to town this weekend. Jared Goff, Cal junior quarterback, has been down the past three weeks, despite this, he’s still 12th in the country in passing yards, 10th in touchdowns, and 21st in QBR. This isn’t to say he’s immortal though, he’s 7th in the country in interceptions and 21st in sacks allowed. 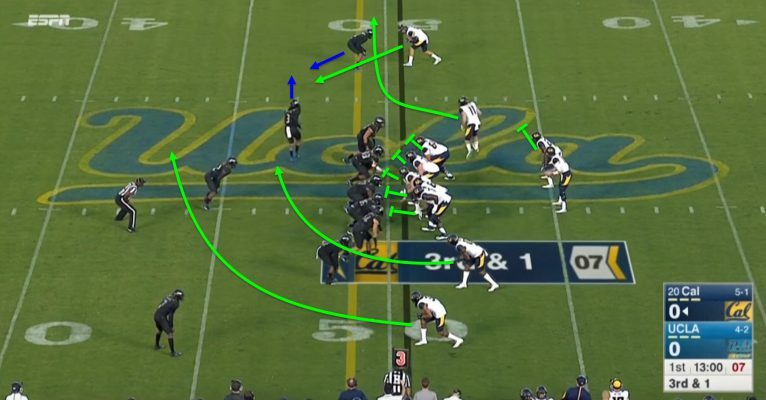 The California Golden Bears go as Goff goes. The first five games of the year, Goff was on fire and the Bears were 5-0, since then, he’s been relatively bad, so the Bears have been 0-3. Goff and the Bears have had some issues running the ball in Pac-12 play averaging just 118.6 yards per game. The injury to starting running back, Daniel Lasco, surely contributed to this, but he is back now and is explosive as always. The Bears run game is the secret to getting their offense going. The Bears need to show they can run the ball to set up the play action and keep the defense from cheating. Let’s take a look at how the Bears run the ball. As you can see in the screenshot above, the Bears are lined up in trips left with a receiver wide right and Goff and running back in the gun. The Utes are lined up in a 4-2-5 across from them. 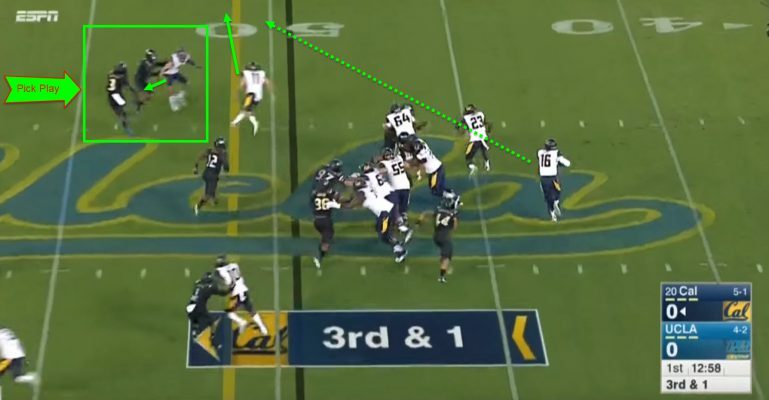 Cal has some shifty running backs that can create big plays. At the snap, the left tackle and guard are blocking the defensive linemen in front of them out; the right tackle is doing the same. The center and right guard double team the left defensive tackle. 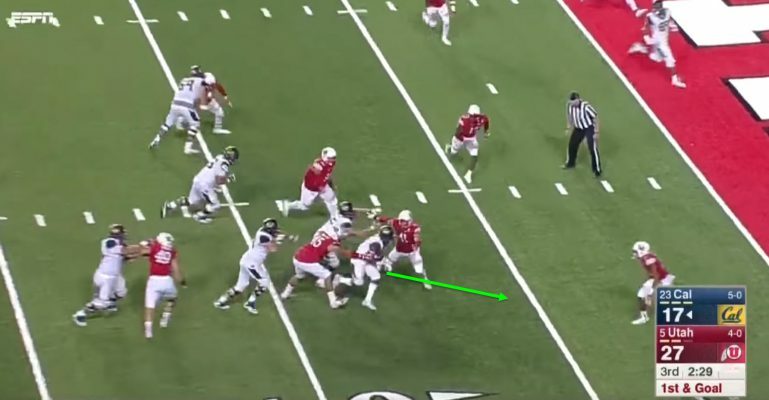 The ball is then handed off to the running back, who sees the hole in between the center and left guard. Getting the blocks is key for the Bears run game. 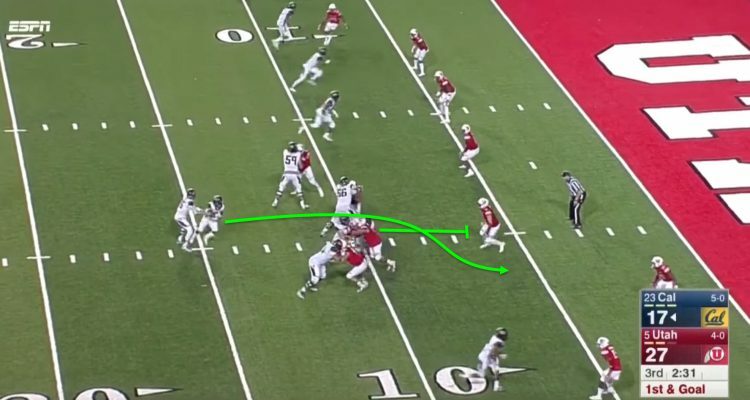 Once the center knows the left defensive tackle is being handled he will move to block the first player he can find at the second level, most likely a linebacker. The running back follows this block and cuts it outside once he gets to the second level. 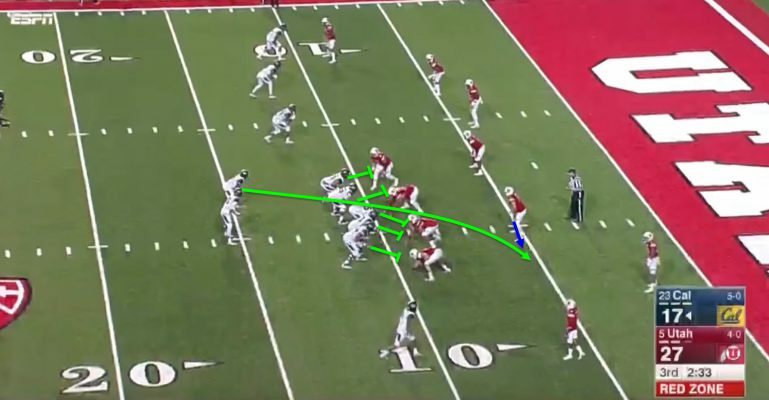 The linebacker is able to get free from the block by the center, but he is too late and the running back is too quick. He bursts right by the linebacker for a gain of seven yards on first-and-goal. The Golden Bears have a running game that can be explosive, but the real threat is the passing game. Sonny Dykes, the Bears head coach, is the equivalent of Mike Leach with the Air Raid (or as the Bears call it, Bear Raid) offense and scoring tons of points. 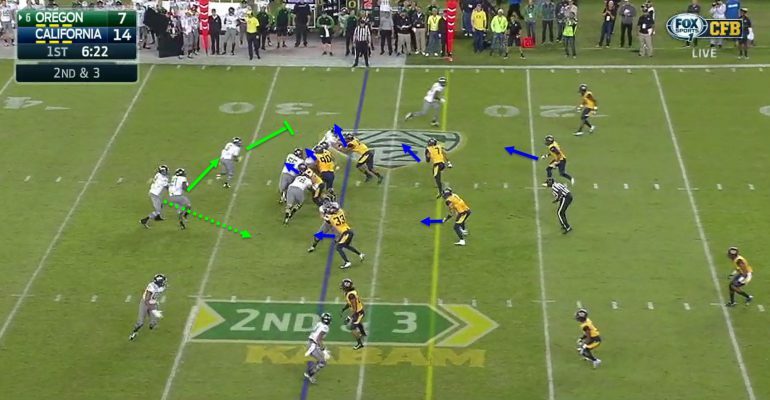 It is because of this that the Ducks’ defense needs to get off the field whenever it can, such as in third-and-one situations. You may remember a pick play from the Super Bowl last year. This next play is a staple in every offense, especially in the NFL. 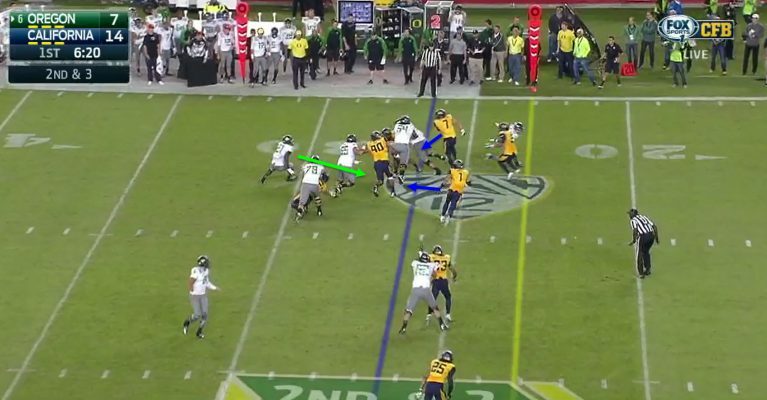 It’s a short yardage play and is one that the Ducks need to neutralize. As you see in the screenshot above, the Bears offense is lined up in doubles with Goff in the gun. The Bruins are lined up in a 4-3 with a single high safety off the screen. On the roll-out, Goff is very accurate, watch out for him on the run. At the snap, Goff is going to roll right with the running back also staying in pass protection. The two receivers wide left are running drag routes at three and seven yards. These are second and third reads though. 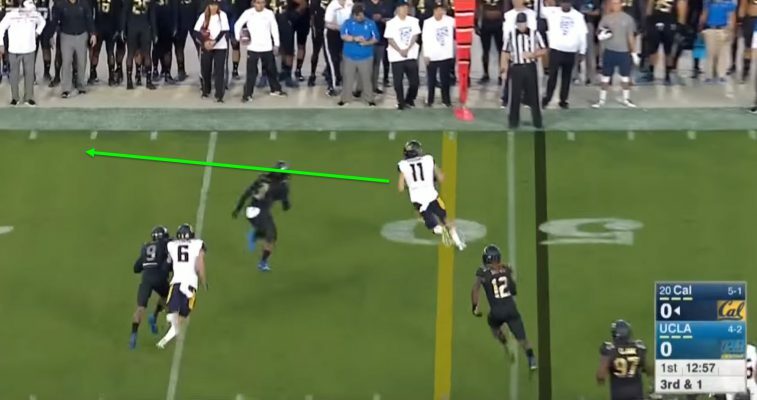 The first read is going to be the tight end who is running a flat route. This play only works if the receiver (wide left) can successfully execute the “pick/rub play.” If the receiver can get in the way of the tight end’s man, it’s an easy conversion for the offense. It’s an easy pass for the talented Goff. In this case, the play is successfully executed, and it goes for a gain of 11 with the help of a broken tackle after the pass is caught. I can’t stress enough how much the defense needs to get off the field when they get Cal into third down. The last thing the Ducks want is Goff to have more time to pick apart a secondary that just gave up 398 yards and 5 touchdowns to a quarterback who is not nearly as good as Goff. The Cal defense is an odd one. They are at the bottom in the country at forcing three-and-outs and punts, but they are the best at creating turnovers. The Bears are +22 on the year. So they don’t get you punting, but they create big plays with a ball-hawking secondary and strip-happy defense. The Bears defense is the strength and weak link of the team. The defense isn’t anything special as I said, but turnovers will spark any team, so Oregon must keep those to a minimum. 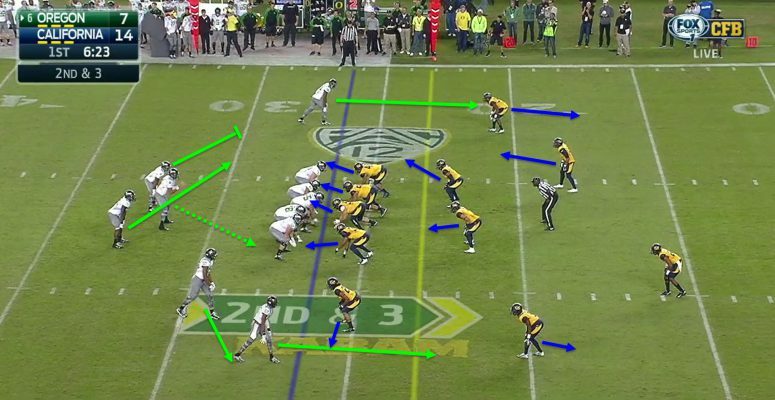 As you see in the screenshot, the Ducks are in one of their standard zone read formations. The Bears are lined up in a 4-2-5 across from them. Cal’s linebackers need to be ready to tackle Freeman this weekend. At the snap, the Bears’ linemen, except for the left defensive end, are going to rush right to force the running back to stretch it all the way to the sideline. The left defensive end and left linebacker are going to stay home to force the quarterback to hand it off to the running back. The linebackers are going to stay away from the line of scrimmage until the running back makes a cut so the blockers can’t get to them. A great defensive play can create a snowball effect for making more great plays. Once the running back makes a cut upfield, the linebacker goes to meet him in the hole. Any other linemen that are able to fight off the blocks are helping with the tackle. The running back has nowhere to go, and gets dropped for no gain. 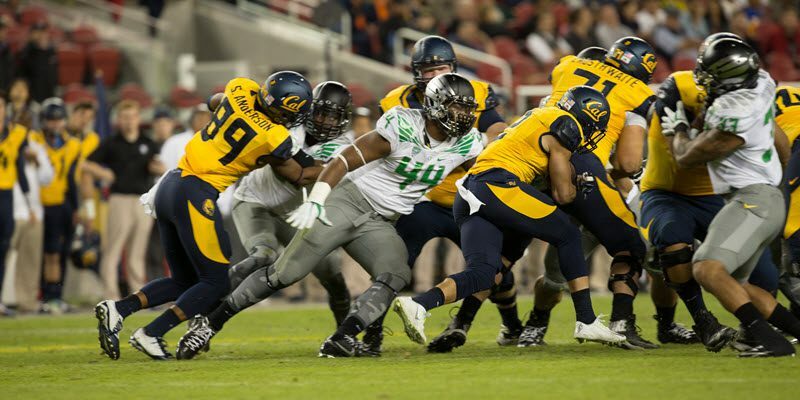 Cal’s defense is a spark plug for the offense. The Golden Bears are an interesting team. They are a big play-only team, on offense and defense. As the Bears have the most takeaways this year, the offense turns the ball over almost as often. They play the way you play Madden, breaking on every route going for the interception and going for every strip, and then trying to make every pass, no matter if the receiver is triple covered, because Goff knows he can make those throws. At some times, it may seem that they are struggling, but believe me, they’ll score, get a turnover, then score and all of a sudden they’ve scored 14 points in three minutes. The 5-0 Golden Bears from the first five games are a Pac-12 championship contender, the 0-3 Golden Bears from the past three weeks are a middling Pac-12 North team at best. Which team is going to show up? I know the Ducks are going to be looking to keep their Pac-12 North title hopes alive. The over/under on this game should be about as high as the Baylor vs TCU over/under will be. It’s going to be an entertaining one, but, unfortunately, I think the Bears are going to win 45-42.